Take a look at your concrete. Do you see signs of wear and evidence of corrosion? Once concrete is laid, it begins to corrode. The process happens very slowly but over time it will be so evident that you’re going to need to call in Cavalier Window Cleaning & Power Washing for concrete sealing. The purpose of the sealer is to protect the surface of the concrete. It will then become more durable and last you a lot longer. It will even eliminate the need to patch up the damage every year. Weather is one of the worst things to happen to concrete. As Mother Nature unleashes her wrath each year, whether it’s snow, rain, hail and heavy winds can really damage your concrete. Sealer can stop this problem. 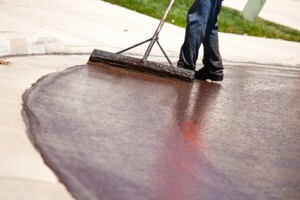 There are store-bought sealers that you can lay on your own, but the professionals at Cavalier Window Cleaning & Power Washing can give your concrete a lasting seal. Our experts know how to improve the quality of your exterior. If the concrete of your Charlottesville home is suffering from corrosion or any other type of damage; sealer is the answer. It’s great for areas of the exterior that suffer from weather and other types of damage. Although Cavalier Window Cleaning & Power Washing preps the areas for sealant, you should know what’s going on at all times. With Cavalier Window Cleaning & Power Washing, you’ll be in full communication with our techs so you can ask any questions you have about the prepping service. If you are seeking away to secure the concrete that surrounds your home, look to the professionals from Cavalier Window Cleaning & Power Washing to provide you with such a service. We can add a layer of sealer to the concrete making it tough and able to withstand more years of abuse. Whenever you need concrete sealing done professional; you can always count on Cavalier Window Cleaning & Power Washing. We are professional, local and always ready to take on new projects. No matter how much concrete is round your home; we can handle any size project. If you are looking for Concrete Sealing Services then please call 434-823-1737 or 540-910-1434 or complete our online request form. My Wife and I had the best experience yesterday with your company. I cannot believe the difference in how our windows look. The detail and service was exceptional. Thank you!! WOW! !